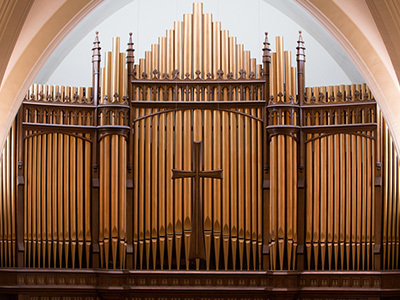 First Presbyterian Church is blessed with a magnificent Sanctuary pipe organ, consisting of 50 pipes and 125 digital ranks, comprising a total of 150 voices. The original organ was a 1912 Felgemaker pipe organ. A new Reuter pipe organ was installed in 1948. The Sanctuary today enjoys a four-manual custom console, manufactured by the Rodgers Organ Company, installed and dedicated in 2008. Its state-of-the-art design allows for a wide range of musical styles, including a full complement of MIDI voices. The Chapel organ is a comprehensive three-manual Rodgers digital instrument, installed in 2002. Our Organist is Mark Sweeney.